Sometimes it feels like roguelike games go hand in hand with indie games, and each week sees another game released. 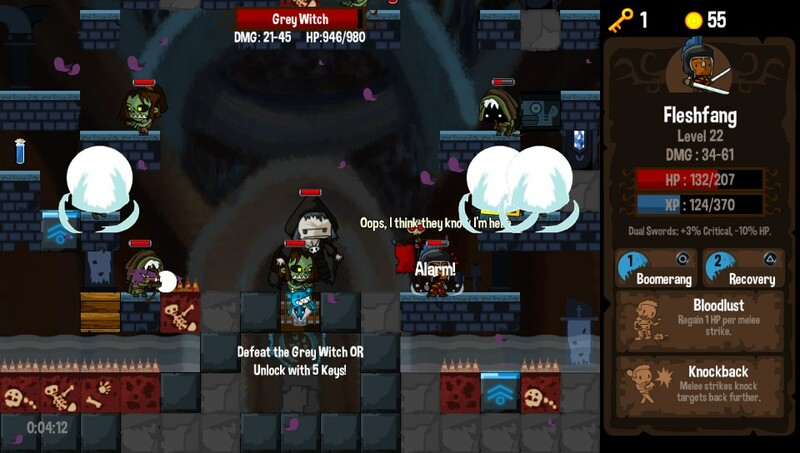 As indie as it comes Vertical Drop Heroes HD is the product of a one man developer Nerdook Productions, and it is another roguelike. So far so typical but what makes this one interesting is, as the name suggests, the hero character is progressing downwards. Vertical Drop Heroes HD looks pretty nice in a 2D style and the fact it doesn’t go for an out and out retro style it to its credit. 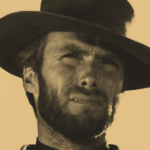 The graphics are crisp and clear and the art style of the various characters and enemies is decent enough to make them stand out from each other. The levels are randomly generated from a series of bricks, and the style of these change between levels, being themed around crypts or dungeons. It’s a clear art style which really benefits the action in the game and stops things getting too cluttered. That’s not to say things don’t get pretty hectic though as each level is created from destructible scenery and later power ups can rip through the screen destroying bricks and creating loads of action on the screen at once. 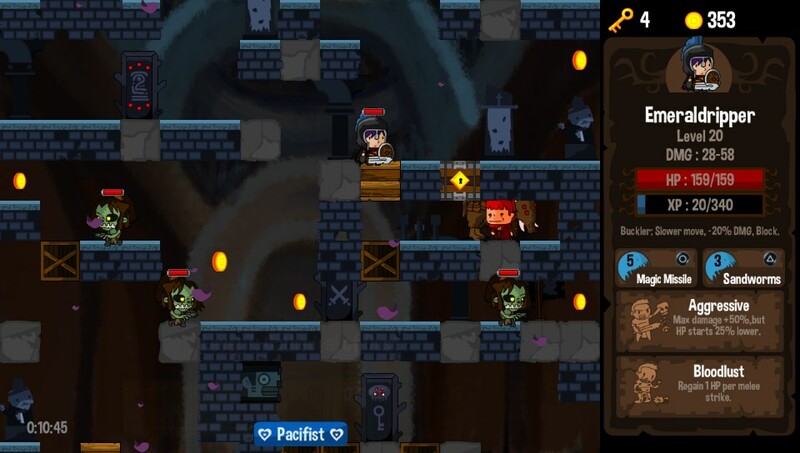 As a rogue like game Vertical Drop Heroes HD is about making repeated runs. To facilitate this the game gives the player a choice between three random heroes before each run. There are a number of variable here and each hero can have different skills and weapons, from crossbows to dual swords there is a lot of variety here. During each run there are a range of power ups and upgrades to be purchased, and this is probably the games strongest aspect. Collecting coins in each run allows the purchase of hero traits, which could be randomly applied to future heroes. These are things like double jumps or health regeneration and they can only be bought during a run, but affect future runs. This means that each run is punctuated by the discovery of these merchants and the anticipation of finding the next one. It’s a nice reward structure which gives the game a great sense of progression. Outside of each run there is a small hub world, no more than a single screen in reality. This hub allows for permanent upgrades to be bought, such as additional health or stronger attacks. The upgrades are also bought with coins, and the number of coins are banked through each run. This means that these permanent upgrades coupled with the random traits give every run a purpose and a goal. It is a really elegant system which rewards the player and kept me coming back for just one more go. Even after a poor run I was able to take stock in the fact I’d earned some coins to pay towards a new upgrade. 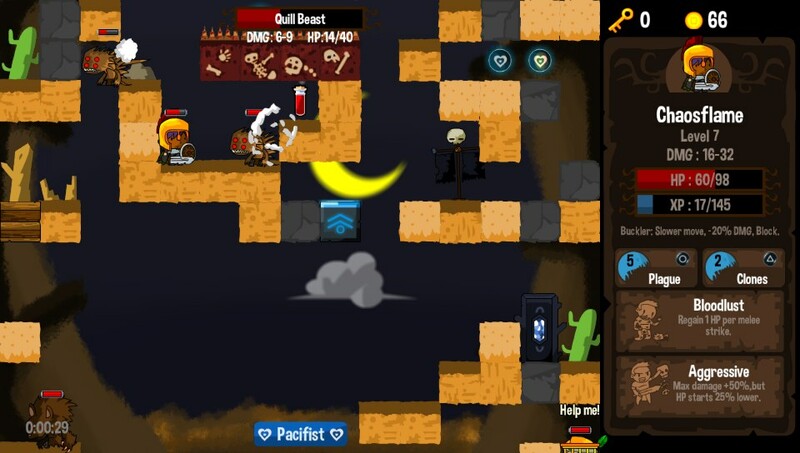 Vertical Drop Heroes HD is split over ten levels, with each level culminating in a boss. The difficulty curve here is pretty well judged not as punishingly difficult as some rogue like games. I died a lot but the way the game handles progression meant I’d always achieved something in each run, something which I really liked about it. The controls are kept pretty simple with the option to have an auto attack mode switched on. What I found well judged with the game is that shortcuts can be unlocked to allow successive runs to be started from later levels. Add these shortcuts to the upgrades which can be bought and this is a game created to be completed and isn’t one which revels in being difficult for the sake of it. There is an awful lot going right in Vertical Drop Heroes HD and rather a lot of content. This is a cross buy title between the Vita and the PlayStation 4, although there is no cross save, and it’s a great game to play on the go. There is local co-op on the PlayStation 4 and the game rewards multiple playthroughs with more trophies and weapons. I’ve really enjoyed my time withVertical Drop Heroes HD and it does a lot of things right. As a roguelike it works really well and the gameplay loop is both rewarding and enjoyable. Vertical Drop Heroes HD is a game which is easy to recommend. There is an awful lot going right in Vertical Drop Heroes HD. As a roguelike, it works really well and the gameplay loop is both rewarding and enjoyable. Vertical Drop Heroes HD is a game which is easy to recommend.